Handy for the station. If you removed the Nicholsons clutter from the outside, it would show off its handsome, tiled exterior to the maximum. Inside, its wooden panelling in a large, airy room with a long bar. A very Nicholsons corporate feel. Transient population, waiting for the trains. Beer was excellent - good beer guide 2019 recommended and a very fine example of Black Sheep. I only had moderate expectations for this pub and was very pleasantly surprised, by the quality of the food and also by the range of quality of the cask ale. To eat I had a beetroot and goats cheese tartlet which was out of this world. To drink there seemed to be a very large range of cask ales, including a mild, which I had and was on good form. The place itself is a typical Nicholsan affair, smart, traditional, and the location is very close the train station. Nicholson's pub near the station with a fabulous tiled exterior. The interior does not quite live up to the promise though. Ales on were St Austell Nicholson's Pale Ale & Skipper, Tetley Cask, Salopian Shropshire Gold, Sharps Cornish Coaster, West Berkshire Good Old Boy & Titanic Plum Porter. CAMRA discount offered on pints only. With a long session ahead, we were only on halves. But maybe we should have shared pints - a very silly rule. Handy for the station. 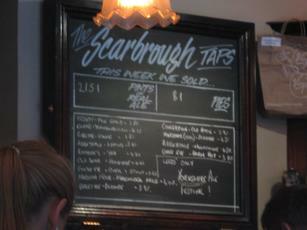 But there are many better pubs in Leeds. 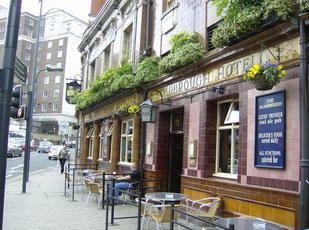 Last couple of times I have visited Leeds totally forgotten the Scarbrough. Anyway went in a couple of weeks ago and to my delight there was Rudgate Ruby Mild on the bar. Have to say the pie list looked really good and I was sorry I had already eaten. A venison pie would have gone down nicely. Owned by the Nicholsons chain, literally a stone's thrown from the station, the pub was a bit disappointing for me. 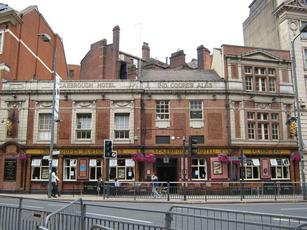 It's a good pub but to say it's meant to be one of the most famous in Leeds it didn't live up to the billing in my opinion. The pub itself has a longish u-shaped bar in what is a reasonably big room (nothing like in Spoons or anything though). The memorabilia included a cabinet with berr mugs and bottles and pictures of various people and places. The beers were doom bar, Cotswold Osprey, Tetleys, Great Heck Christopher, Acorn Barnsley Bitter, Nicholsons own Pale ale, and a couple of beers from Slightly foxed brewery. I went for the Barsnley bitter, a half pint for 1.85, it was a pretty solid drink to be fair. Bar staff were quite friendly and the punters in there seemed quite down to earth/not snooty. Good pub overall but if you go don't over hype it in your head too much.